Canon just announced another camera in their full-frame mirrorless line-up, the EOS RP. This is a lower priced mirrorless camera, aimed towards those photographers that are looking to step up to a full frame camera, without the price tag of the EOS R, or 5D Mark IV. The camera comes with a full frame 26.2 megapixel CMOS sensor with phase detect autofocus and 4k video, at a very reasonable price tag of $1,699 CAD. The biggest difference between the two are the price tag. The EOS RP comes in at $1,699 CAD, compared to $2,999 CAD for the EOS R.
With the lower price tag, comes a little less in terms of performance of the EOR RP compared to the EOS R. The camera comes with a 26.2 megapixle, slightly less than the 30.3 megapixels of the EOS R. It comes with the robust autofocus phase-detection system that was introduced with the EOS R, and 4,799 selectable autofocus points. The camera also comes wth a lower frames per second, it’s 4 when using AI Servo autofocus, compared to the 5 with the EOS R.
A few other things that I noticed when reviewing the camera specs is that the battery life is less than half of that of the EOS R, and only advertised to be 270 shots. So while the camera is lighter, the lightest full-frame Canon camera, weighing just over one pound, but this weight savings might be offset by all the extra weight of carrying batteries around with you. Another thing that I saw that would be slightly annoying for people with other Canon cameras (7d mark II, 5D mark III, etc) is that it uses a different battery, whereas the EOS R uses the same battery as those other cameras, so eliminates the need for an extra charger, and different kind of batteries. In comparison to the 6D Mark II, the DSLR entry level full-frame camera, the EOS RP comes in at the same number of megapixels and less frames per second. The EPS RP weighs less than the 6D Mark II, with the 6D Mark II weighing 1.51 lbs versus 1.07 lbs, and it is smaller overall. 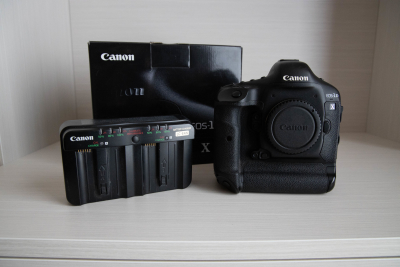 Best of all the the EOS RP is less expensive, with the 6D Mark II coming in at $1,999 CAD. So it really makes me wondering why you would pay more for the 6D Mark II. *Frames per second for the mirrorless is bases on being in AI Servo AF. If you are in the market for a new full frame entry level camera, the EOS RP seems like it will be a nice place to start. If you have any questions, feel free to get in touch with me at contact@wildelements.ca. 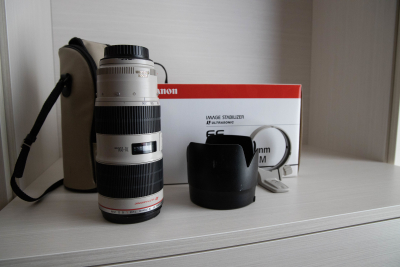 I am selling my used Canon EF 70-200 f/2.8L IS II USM. 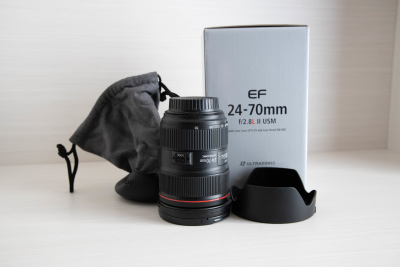 I am the original owner of this lens and I am selling it because I have upgraded to the 70-200 f/2.8L IS III USM lens. This lens is in great working condition. There are some signs of wear and tear with some paint scuffs around the mount, and on the lens hood. These are cosmetic only. I’ve had a random finding a couple times now while shooting with the EOS R while it’s snowing. It seems to want to focus on the snow, or more really the snow pulls the focus away from the subject, and it has to work harder to keep focused on what I want focus on. It is crazy how drastically it impacted my “hit ratio” of sharp shots when it’s snowing versus not snowing, it’s like I went from not missing a shot, to having a ratio of 50% if it started snowing. In Yellowstone, I started making the decision to switch to the 5D Mark IV if it was snowing out. I tried to switch to different AF Area modes to see whether there was a difference between single point, expanded point, etc., but I did not see an improvement, and as the point got bigger it seemed like it was jumping off the subject more, which makes sense. Next time we get a good snowfall around here, I am going to go out with a stationary subject and see what they hit ratio is. I saw that Canon is intending to put out a new firmware for the EOS R, and while the details of the update have not been disclosed I’m curious whether or not this will be addressed. I’m curious how this finding will be impacted by heavy rain that sometimes occur on our coastal trips, and whether this camera will essentially be unusable in these situations. I will keep testing and playing around with it, and keep you updated on what I find. Feel free to contact me with any questions contact@wildelements.ca. I have owned the Canon EOS R for a couple months now, but with short days and busy schedule I have not had the chance to get out and shoot (and more importantly compare it to other cameras) as much as I had hoped. Luckily I have some time off coming up, and in addition to testing my new 400 f/2.8 III I am looking forward to spending time with the EOS R as well. The first thing I will say is that I am pleasantly surprised with the performance of the EOS R. I had previously picked up the Sony a7iii which also surprised me, and all initial reports is that the a7iii was superior. While I have not had a chance to compare the two head-to-head, so therefore have no opinion on which is better, at the end of the day I am very happy with the EOS R, and will be keeping it over the a7iii, with the main factor being the compatibility with all my existing lenses, and I have not been happy at all with the metabones adapter. One thing that I don’t really have a handle on yet is the autofocus and how it compares to the Canon dslr’s and the Sony a7iii. What I will say is that I am very impressed with how quickly the EOS R acquires focus, it is like you point your camera at the subject and it’s instantly in focus. 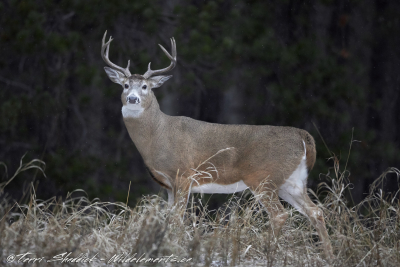 While I have used it with Big Horn Sheep and deer running, I still cannot say how well the focus stays locked-on and tracks with the subject, and whether there is a noticeable different with other cameras. The number of AF points and the fact that you can move them over the entire viewfinder is a nice feature, especially for framing some shots, especially because I find that the Canon DSLR’s are quite limited on the edges. I do find however that it is a bit slower navigating across all the points, as you can sometimes get yourself way over to the side accidentally. I think it will just take some getting used to. I expected the ISO performance to be “okay”, but did not have high expectations. Well this might be one of the biggest surprises. I have taken photos consistently at ISO 3200, and even a few at ISO 6400 that I have been extremely happy with, both in respect to noise and dynamic range. This is one feature available in other mirrorless cameras that have been released recently which did NOT come with the EOS R. While I am not super upset about it because all my lenses that I shoot have image stabilization, the one area where I did notice that it was very beneficial on the a7III was when shooting video from a moving zodiac on rough water. For me this is not a deal breaker, just a “would have been nice”. I have also heard that it works quite well with the Nikon Z7. I guess this will be a feature for the next Canon mirrorless. I can’t say that I am in love with the placement of the buttons/size. Having small hands, I thought that this would be nice that all the buttons are closer together, but I find some can be quite awkward to get to, especially if trying to access them while shooting and looking through the eye-piece. I do have some difficulty going back and forth from the DSRL’s and the EOS R.
The other thing I found hard to “pick-up” was the menu, as I was expecting it to mirror (pun intended) that of the DSLR’s. Instead Canon has a lot of embedded menus, which can make it difficult to find things, or make changes….especially without the manual and in an area without cell coverage. For example it took me over five minutes to figure out how to change the view so that the electronic level wasn’t showing in the middle of the image (making it near impossible to see the subject). Again, I think this is just something that will take getting used to. I’m looking forward to spending more time with the camera, and also comparing it to some of the others in my possession. If you have any questions, feel free to contact me at contact@wildelements.ca and if you want to see a full list of features, refer to my first blog post on the EOS R which can be found here. 12 Dec It’s here! Canon 400 f/2.8 L IS III Arrived. My Canon f/2.8L IS III has arrived, after waiting for what feels like forever…in all reality it was only a few months. It’s arriving just in time for me to take it to Yellowstone to start testing it out. My first impression was I could not believe how light the box was…I thought maybe I was getting ripped off, and the box was empty. Un-boxing the lens and comparing it to the v2 of the 400 f/2.8 I really cannot believe how light it is. And while the specs state that it is lighter than the 500 f/4, to me they feel about the same…which is fine by me, because I have not problem hand-holding the 500 for extended periods of time while shooting in the zodiac. I am really wondering if I will even need to keep my 500 f/4 now, as the only reason I had it now was because it was lighter and more portable than the 400 f/2.8L IS II. With the improved image stabilization I am curious to see what shutter speeds I can shoot hand-held at, and whether or not there is any difference from version 2. It did feel like the weight distribution was changed, but hard to say how much is true weight savings versus weight distribution to to “feel”. Other than that, I have had no time to test it out, darned short days and “real job”, but I will have a week with it in Yellowstone coming up and will share my thoughts on in then. For my blog post from when the 400 f/2.8L IS III was released see here. If you have any questions, feel free to email me contact@wildelements.ca. Capture One Pro 12 is now available for purchase, or download (if you are on a monthly subscription package). Along with an update to the general look and feel of the product, they made some really notable changes to the image editing capabilities…some which I think makes it exceed that of Lightroom. The most notable change in the addition of luminosity masking capabilities, where the mask will automatically be applied to the image based on a selected luminosity range. In addition to darkening super bright areas of an image, you can also apply the mask to only the darkest part of an image and therefore pull shadow detail from one that section. This is a function that used to require some complicated actions in Photoshop, especially for image editors that are not super technical. In addition the the luminosity masking, there are enhanced gradient masks (both linear and radial). The beauty of these masks are that unlike Photoshop is that they do not overwrite the luminosity masking…so you can do these AFTER a luminosity mask, or in conjunction with the luminosity masking. One further feature is the ability to copy edits from one image to another, and ignore composition edits. While this isn’t totally relevant for wildlife and nature photographers, as we are often editing different images, this could be really handy for photojournalist or portrait photographers. More about the updates can be found on the Capture One Pro website. Feel free to contact me, contact@wildelements.ca if you are looking for additional details on my experience with the update. When I first saw that Canon was releasing a new 70-200 f/2.8L IS III lens, I was excited because I thought finally an update on what I think is the oldest lens in my fleet. I had hoped that in addition to a performance update, I would also see some weight savings, which would mean that it might find itself in my camera bag more often. Well, when it came to the weight, my hopes were not fulfilled. The new 70-200 f/2.8L lens is only SLIGHTLY lighter than the old version, like 50 grams (1490g vs. 1440g). I haven’t had the change to weigh the actual lenses since I have picked mine up but I will say that I really do not notice any difference in weight between the lenses when the tripod foot is removed. With the tripod foot on, there is a slight difference in weight, but certainly not the earth shattering weight difference that we are seeing with the new 400 f/2.8. 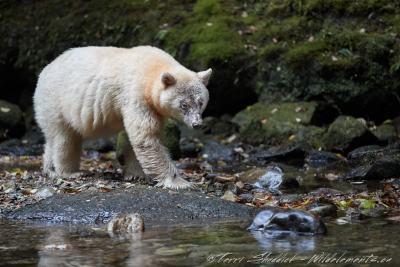 I was debating whether or not to bring the lens on the Great Bear Rainforest trip, and wondered if it would feel like a duplicate because I knew I would be brining my 100-400 lens, and had weight restrictions to keep in mind. 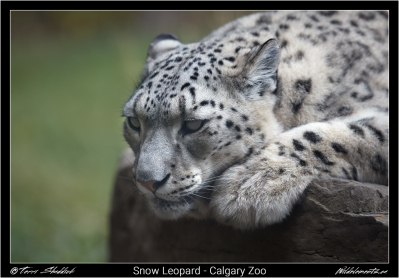 In order to give the lens a quick test I brought it to the Calgary Zoo. I have to admit, I was really pleasantly surprised by the results. 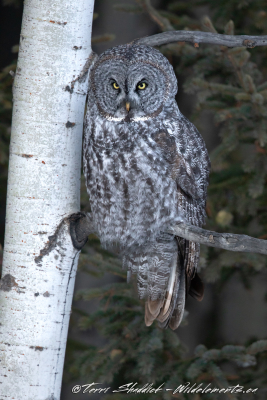 Since I have purchased the 100-400 a few years ago, I haven’t found that I am using the 70-200 as often, because it often doesn’t have the focal length needed for a lot of wildlife. But reviewing my images from the zoo, it really made me consider that I should be using it more. One of the zoo images included in this post was of a Snow Leopard, and considering that this image was shot through the glass, I was really surprised how sharp it was. In addition to being shot though glass, I also shot it at only f/2.8, because the green background was really quite ugly and distracting. I was surprised that I was able to see the hairs on the snout of the Snow Leopard despite that it was shot through the glass. 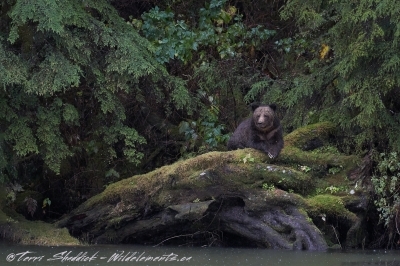 Despite it not being much lighter than the old one, I decided to pack it along for the Great Bear Rainforest trip given the results that I had with it at the zoo, and I am really glad that I did. The second day out shooting we were shooting in the heart of the rainforest, and because the river was not that wide, we were actually working at pretty close focal lengths. I ended up using the 70-200 pretty much exclusively that day, at least where the “big subjects” (like bears) were concerned, and the lens did not let me down. I found that having an f/2.8 lens greatly improved my images, given the low-light I would have constantly been battling high ISO and low shutter speeds if I had used the 100-400. Seeking Salmon was one of the shots that were taken with the 70-200 f/2.8L IS III USM, and was actually shot wide open, because I wanted as high of a shutter speed as possible given that I wasn’t sure if the Spirit Bear was going to pounce at a salmon (if she could find one). I have not yet done head-to-head testing between the new and old 70-200, and I do not know if the slightly lighter weight and fluorine coating are worth upgrading from the old one to the new one (stay tuned for that). 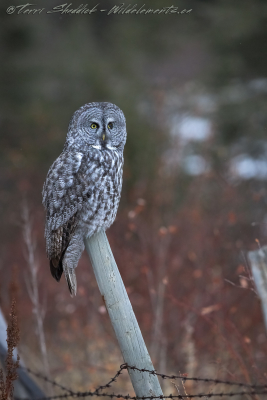 I will say that if you are planning to add a 70-200 to your fleet of lenses, you will not be disappointed with the image quality achieved with the 70-200 f/2.8L IS III USM. If you are debating getting this lens and have any questions, feel free to reach out to me at contact@wildlements.ca. Or stay tuned to my recent photos and blog for more thoughts as I use the lens more, and review more of the images taken with the lens.